While the first semi final of Euro 2012 is being played between the defending champion Spain and Portugal Wednesday evening, Germany gets ready for its semi final against Italy on 28th June at National Stadium, Warsaw Poland. Italy marched into the semi final as luck favoured the Azzurris in the penalties aginst their match with England. But would they be lucky against the Germans too? Remember, Germans are win-less against Italy in the Euros and World Cup. It may be added that the German-Italy duel would remind many of their duel in the semi finals of the 2006 World Cup, when the Azzuris beat Germany 2-0 in the extra time. Italy then went onto win the World Cup five days later while a German victory of 3-1 victory over Portugal have them finish third. Although the Germans prevailed upon their group matches and won all of the matches, it took them a while and face tough Greek resistance in the quarterfinal - though they finally won over the Greeks 4-2. Germany have won three World Cups and are trying to win their fourth European trophy. as for Italy, they have four World Cup trophies and are for their second Euorpean title. Meanwhile it is learnt that the German coach Joachim Loew has told his team to forget past disappointments and just focus on beating Italy - or shall we say that the German hunt for a first tournament win over the Azzurri has just started? So who wins Thursday night? Well Germans are favourites - but they have never been able to outscore Italy. So let us watch the match and see who previals and marches into the finals. 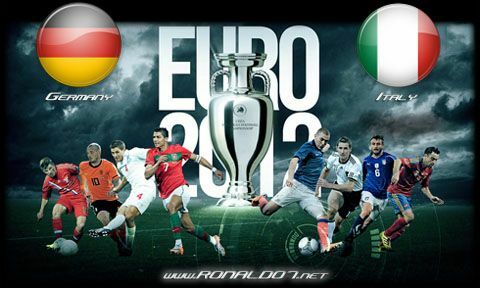 Watch the exciting semi final between Germany and Italy on Thursday, 28 June 2012 at 18:45 GMT live from National Stadium, Warsaw, Poland.